5/8" genoa sheet. Note the blue bottom paint. I thought I had long ago absorbed the lesson of not starting the motor (or doing so very carefully) during a crew-overboard (COB) situation. Don't get the wrong idea - nobody went overboard - but I failed to transfer that COB lesson to this different but similar situation. So unlike the previous engine troubles we have had, this mishap was due more to my mistake(s) than to bad luck. We had planned to get 10 miles offshore from Charleston and then sail as direct a line as possible to St. Augustine. Since the US coastline runs southwest from there before turning south and then back east in Florida, a direct course to St. Augustine diverges from the coastline. We planned to stay well west of 80W longitude to avoid the Gulf Stream. Predictions were for light NW and WNW winds changing to 25 WSW an hour or two before dawn Thursday for 12-15 hours, then back to light winds. Unfortunately, the weather came in sooner and harder than predicted. Combined with that was that we let ourselves get too far east and into the edge of the Gulf Stream. Waves at first were 6-8 feet on the beam and then just messy and very steep. Eventually, the boat was doing wild things. If you've never been on a boat this size in these conditions, let me paint the picture: large washing machine. Cash - after things had quieted down. his parents. 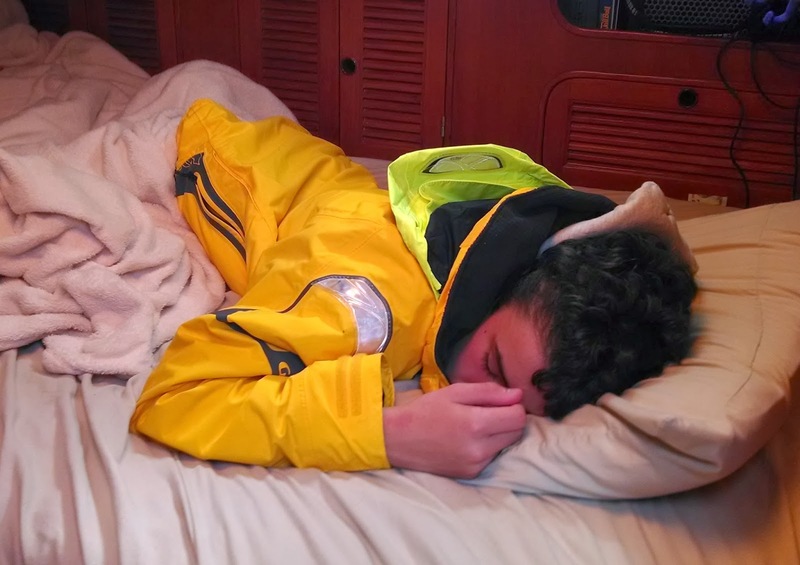 (The seasickness put a stop to the questions ha ha....) Joking aside, he did his duty despite four rounds of vomiting. Nicole was next to be sick, and she took it in stride: "there goes last night's kale," she said, just after vomiting. I lost my own dinner several times over. Only Paula didn't get seasick, and she was amazing, spending hours on the helm (And that after fixing us a hot meal earlier in the night). At one point she heard a loud clatter and called me up. 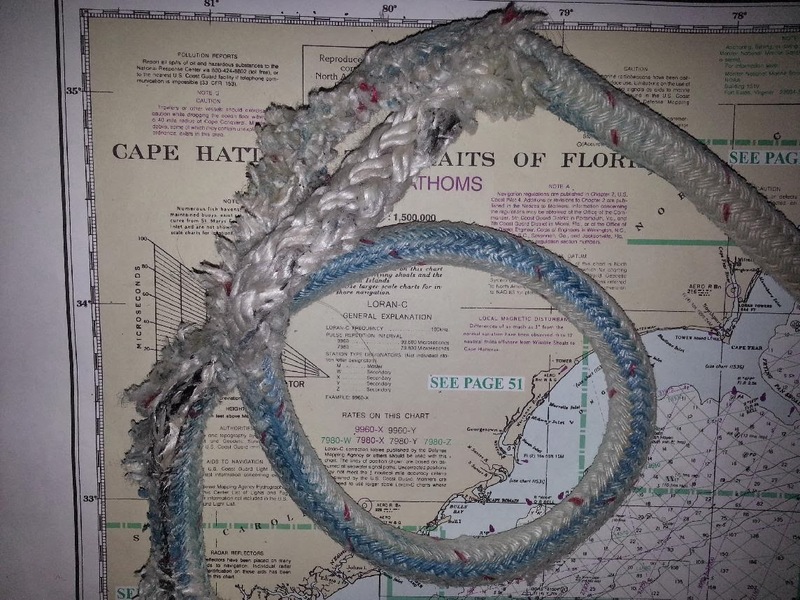 The radar reflector had chafed through and fallen (from the flag halyard under the port spreader). She saw it dragging along in a wave on the leeward side of the boat - above her head. (I reached out and snatched it). 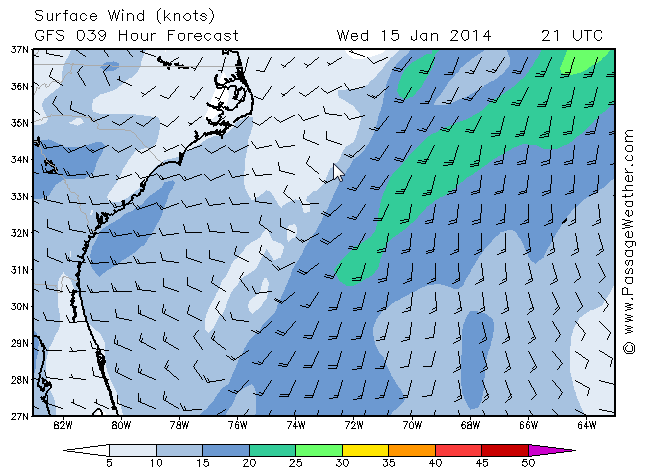 By about 0330 it was blowing 28-33 kts and we were flying only a staysail. All was going well, actually, and the seasickness was diminishing all around, but there was a large freighter to leeward that I had been eying for the last couple hours. Our courses were slowly converging. I kept thinking he would pull past us, but he was making no more speed than we were. Finally I decided we needed to tack, and I called Paula up to help. We tried to tack through with just the staysail, but we couldn't do it, so we unfurled the mizzen sail to drive us through the tack. It promptly broke and began flogging wildly. By the time we got the mizzen secured, I was starting to feel some urgency; I didn't want to be anywhere near that freighter, and certainly not upwind of it. We started the motor to power us through the tack. That took the pressure off, and we held that course for about 15 minutes to get well clear. We then decided to tack back, again using the motor. Genoa sheet wrapped on prop shaft. Unfortunately, I didn't consider that we had taken quite a few waves on deck, as is often the case with a COB situation. This left lines streaming overboard. I put the engine in gear and powered up to tack again. The engine stopped with a very nasty, very solid noise. (Yes, our NEW engine). I knew immediately what had happened. We had wrapped a line around the prop. I cursed for a minute or two (to clear my head) and then went down to look things over. Most importantly there was no water coming in, but it was clear that the motor mounts were broken. I went on deck to investigate. 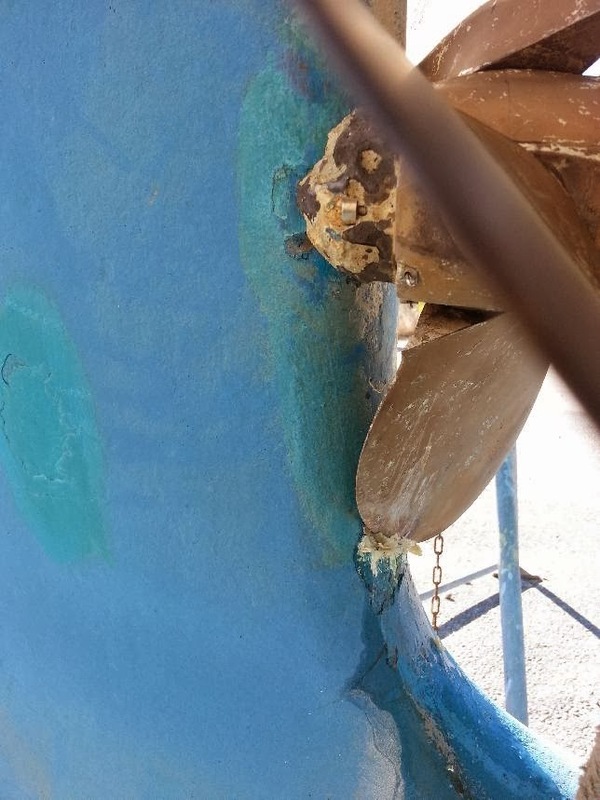 It was the middle of our big 5/8" genoa sheet that had caught on the propeller and wound around the shaft. I felt rather sick that I had stopped our new engine, but I wasn't overly worried - we've spent some time being engine-less. I figured we'd head to the nearest inlet that wind allowed and use the dinghy to get us to the dock or worst case, get a tow. Only one problem - no steering whatsoever. Helm was absolutely locked. OK, now the situation was starting to worry me a little. 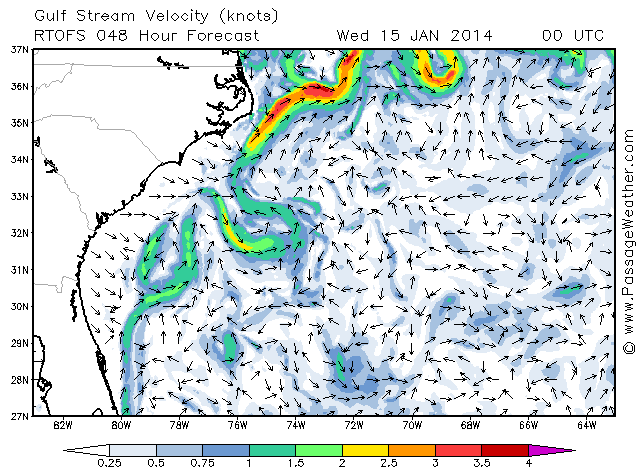 We were almost 40 miles out - just into the Gulf Stream - with no motor and much worse no steering. We waited a while to calm ourselves down. Things were under control. We were effectively hove-to with the staysail sheeted tight on port tack and the helm jammed hard to port. Unfortunately, this had us heading back north with lots of help from the Gulf Stream. Next stop Cape Fear? We could have achieved some steering of the boat with sails alone, but our progress would have been very poor. We began issuing alerts on the VHF (pan pan) just to make sure anybody heading our way knew our situation. We checked cell phones. No coverage. We called TowBoat US on VHF, but we got what we expected - nothing. We were way beyond the range of VHF. 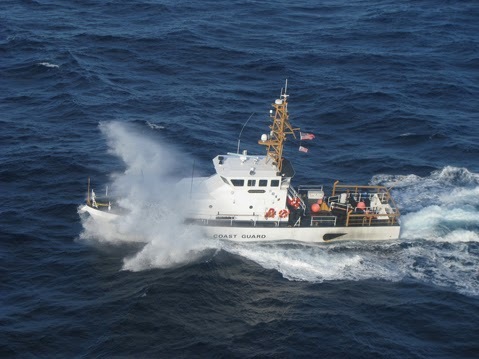 Finally we hailed the US Coast Guard - not for rescue - but to ask them to contact TowBoat US. (Their radios are more powerful than everyone else's). 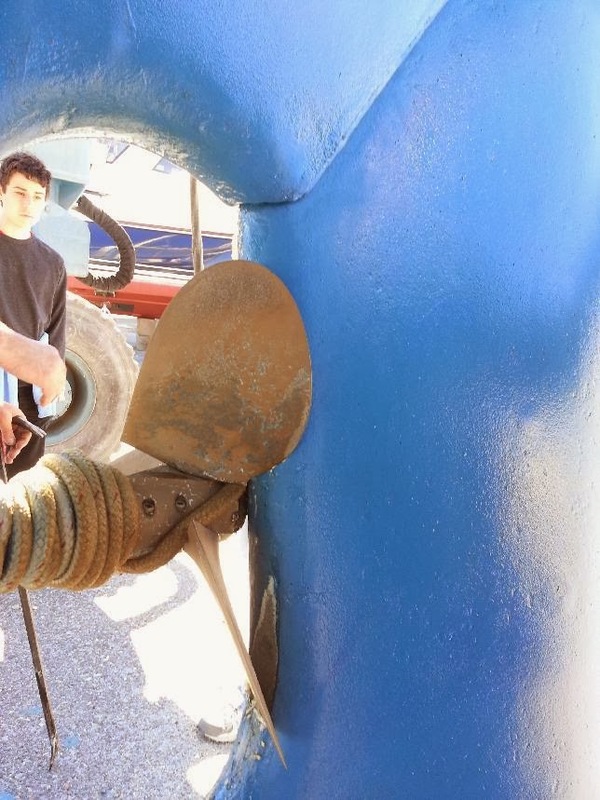 They asked us lots of very detailed questions and said they would contact TowBoat US. However, we lost communications with them for about 30 minutes, and I think this worried them. When we regained contact with them, they said they were sending a cutter. I also think they decided this because of the kids on board. The small (87') Coast Guard cutter arrived a bit before dawn. They spent a some time considering the situation and observing our boat's motion. When they were ready, we dropped our staysail and I went to the bow of our boat to catch a heaving line thrown by a crewman (which would be used to pull over a bigger tow line). However, the high winds and messy waves made this a very difficult throw. 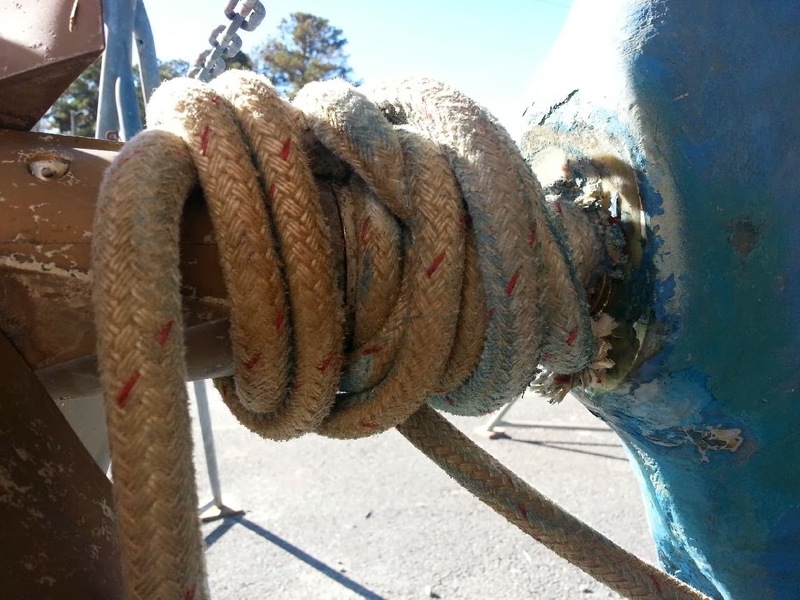 On the fifth try, the heaving line hung across our forestay too high for me to reach, so they moved their boat close enough that I could have slapped hands with a crew member. 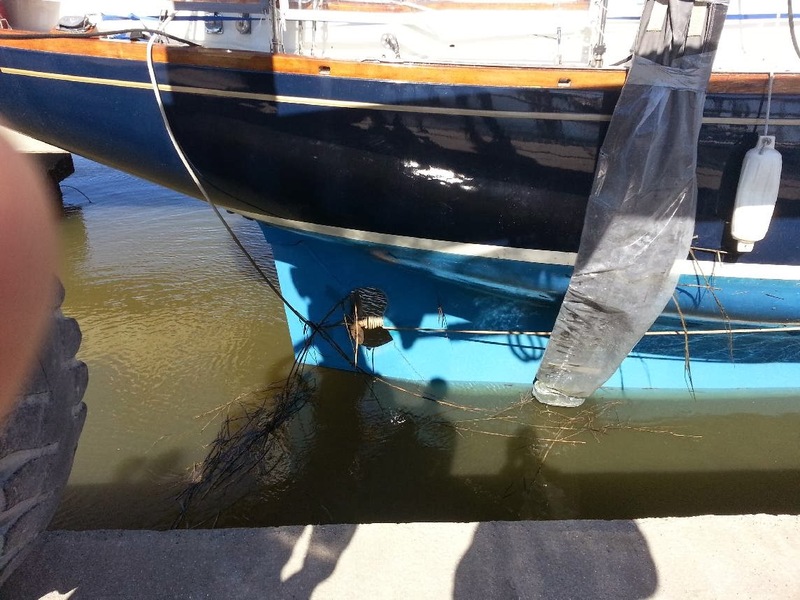 That this was done with no contact between boats is a testament to their outstanding boat handling skills. I was extremely impressed by their teamwork and all-around professionalism. With the heaving line finally in hand, I hauled over the towline and hooked it up. 15 nm and almost five hours later, they handed us to TowBoatUS, and eight hours after that, we were at the Hinckley yard in Thunderbolt, Georgia near Savannah. In thinking about what we did right and wrong, it is obvious is that we made a big mistake starting the motor under these conditions without checking for lines in the water. This is oft-repeated advice for COB situations, but it just didn't occur to me here. Another smaller mistake was letting ourselves get onto the edge of the Gulf Stream. However, there were many positives here. Through it all I was very pleased with the soundness and sailing qualities of our boat. I am also pleased with our judgement on sail changes - we reefed early, and we kept our sail plan conservative. We kept calm, and we worked very well as team. Nobody panicked, and nobody wants to quit. By the time we got to the dock, Cash and Nicole were already joking about life in a washing machine and about barfing. 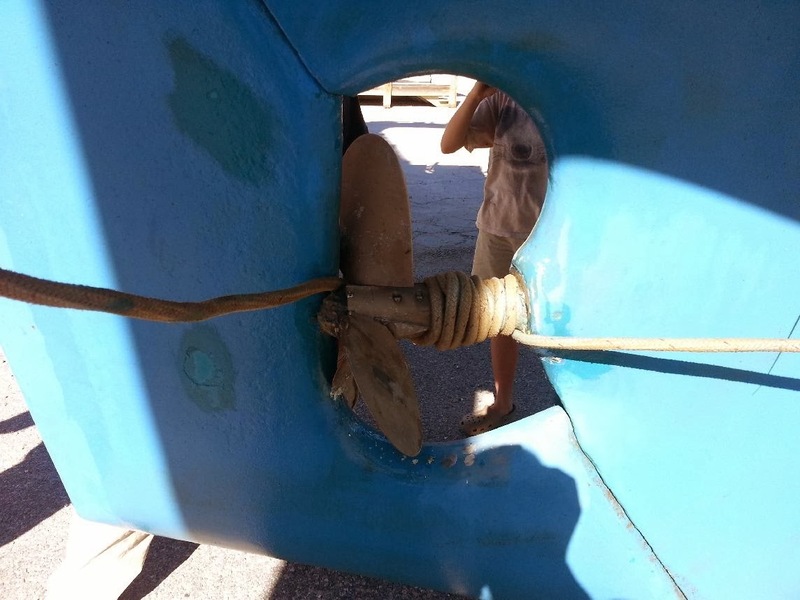 Incidentally, the mode of failure was this: as the line wound around the propeller shaft between the propeller and the boat, it pushed the propeller aft, pulling the shaft partway out. This pulled the motor back, breaking the mounts. 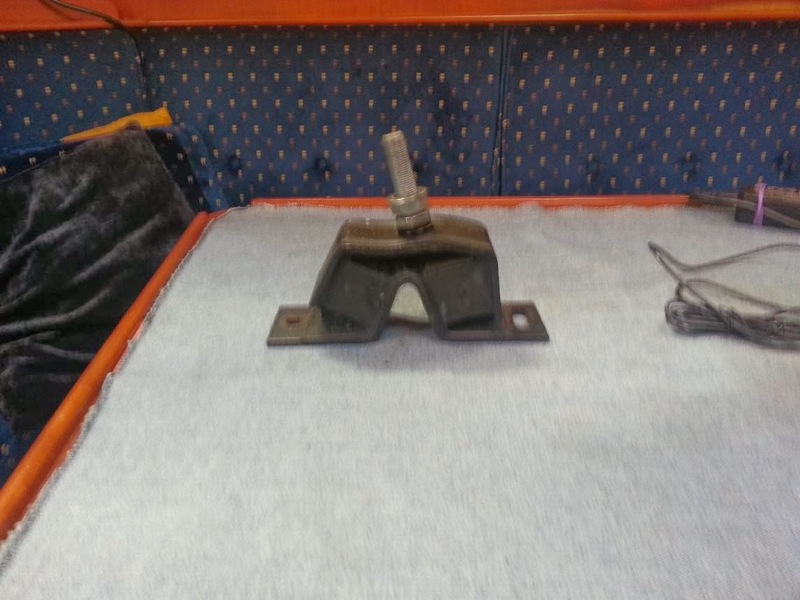 Luckily our rudder is behind the propeller, so eventually the propeller bit into the rudder, and this is what stopped the motor. Yikes. Obviously, at this point we have fixed the problem and moved on. (More in a subsequent post). We are thankful that we are all safe, we are grateful for the help we received, and we are happy to be cruising still. Glad you are all safe and the boat is sound. I think you need a different type of adventure on this cruise...you have had enough boat issues! Sheesh, I agree. We cruised for over two years pre-kids and had almost no trouble like this. Apparently I need more practice haha. Hope you're doing well, Bob! This post made me -- having acute motion sickness -- nauseous just reading it! Glad you guys are safe and sound and on course. Quite the adventure and then some! We think about you out there! Thanks, Kristi. We miss you guys. Hope you're doing great, and surviving repeatedly being vortexed!